There is a famous saying that eyes are the window to your soul. There is definitely something very special about them and looking into someone’s eyes can be very captivating. So if you want people to notice your eyes more, why not enhance them with beautiful eyelashes that will make your look magical. If you don’t have naturally long and thick lashes or you want to enhance them, AiryHair offers 3D glued in eyelashes that are made of the real human hair. Synthetic ones are simply a waste of money and don’t blend in properly. Because we use human hairs, they will be indistinguishable from your natural ones. The best part? You can use our glue-in lashes repeatedly, for a very long time. How to Pick the Right Eyelash Size? AiryHair offer you as much as 10 different styles you can choose from. It all depends on the occasion you want the lashes for. 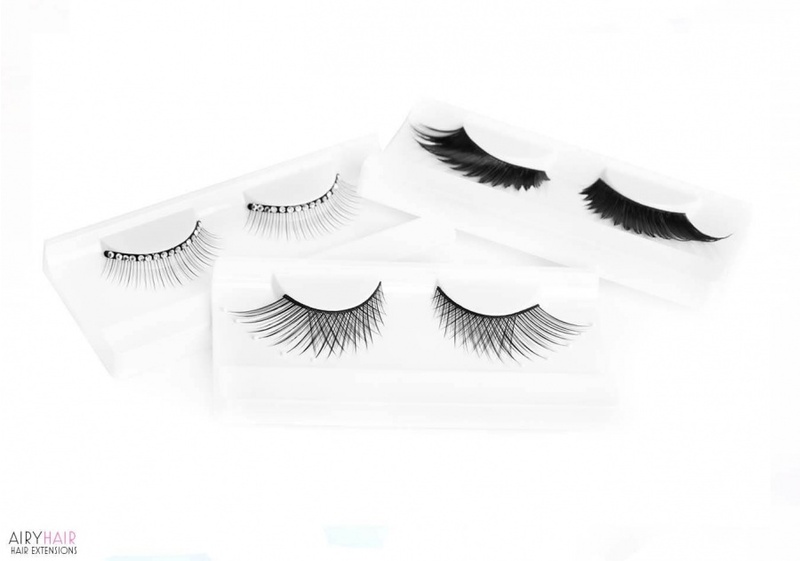 If you’re looking for more of a daily look, go with the thinner and shorter ones, but if you need lashes for special occasions and parties, then go with a more glamorous look with long, full eyelashes. 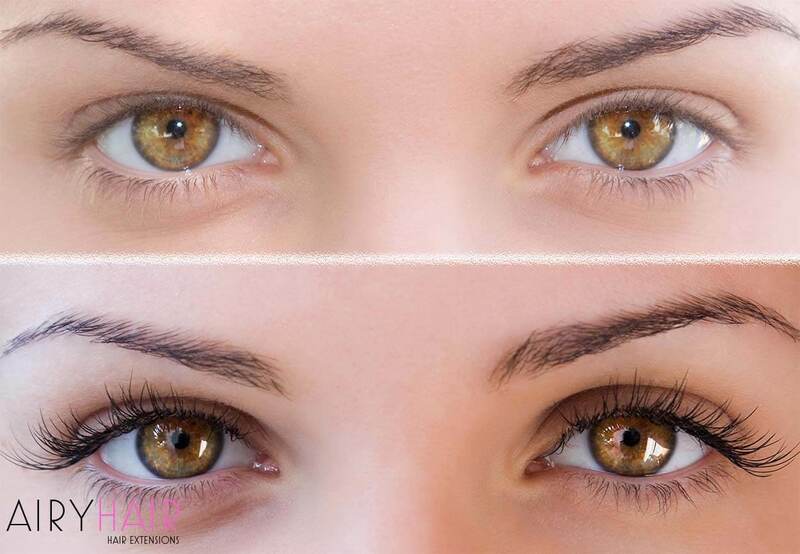 The first thing that you want to do is make sure that the eyelashes are the right length for your eyes. They usually come a little bit longer than what you need so you’ll probably have to trim them. But you definitely don’t want to leave them too long because the lashes will look too heavy on the eyes. Also, make sure to cut the outer edge of the lashes, never cut the inner edge or else you will ruin the shape. Don’t worry if you cut too much by mistake because then you can use them as corner lashes and it’s always better than having them too long. How to Apply and Glue Eyelash Extensions? The application process is actually very easy once you get the hang of it. There is no need to have it done by a professional, you just have to be patient and careful and you’ll learn how to apply your lashes in no time! First, you need to prepare your own lashes. Give them a bit of a curl and apply a bit of mascara. You can also use eyeliner on your eyes if you want to, that can help the them blend in more naturally. Now you need to apply a thin layer of allergy free glue along the lash bend and add just a little bit extra on the two ends. That way you ensure that they won’t come off throughout the day. Don’t apply too much glue because when you press eyelashes to your skin, the glue is basically going to go everywhere and you’re going to end up with a hot mess on your eye. Also make sure to buy high quality glue because you don’t want your lashes falling out. There is dark and transparent glue. Black glue is a great choice because it blends in more naturally and you don’t have to worry about the glue being visible on your eye. Now wait for a glue to get tacky, it usually takes about 30 seconds, depending on what kind of glue you are using. You shouldn’t put them on your eyes right after you have applied the glue. So be a little bit patient and wait. While you’re waiting, you can curl the bend slightly with your fingers, that way it will be even easier to apply them. When you’re ready to start applying your eyelashes, tilt your head up and look down into the mirror. You want to keep your eyes. It is best to use tweezers to hold them. If you use your fingers, you won’t have as much control over the whole application process. So hold the eyelashes with your tweezers in the middle. Make sure that they point up and not straight, that way they will look a lot fuller. Now apply them as close as you can to your lash line. There shouldn’t be a lot of space between your lashes and the extensions. But also be careful not to glue them on your own lashes. To avoid that, you can gently place them, and then take the outer end with the tweezers and pull them up a bit and repeat the same process on the outer end. That way, you can make sure that you’re not gluing them on your own eyelashes. You can also use this process to blend the ends better, making sure they follow your natural line. After glue becomes dry, and you can push lashed up a little bit with your fingers. And lastly, you can put a little bit of mascara and press the lashes together so that your natural and extra eyelashes stick together. How to Remove and Clean AiryHair Natural Eyelashes? To remove your extra eyelashes, take some of oil-free makeup remover and dip in a cotton swab in there. Run it across your eye line and the band. That will soften the glue, allowing you to simply take the eyelashes right off. If it doesn’t come off as easily, just add more makeup remover. Make sure to clean any glue from your eyes and the lashes. This way you can use our natural eyelashes repeatedly. First, pick the residue glue off with your fingers. Be very gentle in order not to damage them. Then take a bowl and fill it with warm water and dish soap. Put the lashes in and let them sit there for a little bit. Take them out of the water and rub lashes in between your fingers very gently. You have to be super careful when washing extensions because they are very fragile when wet. If there’s any glue still one, take it out with a pair of tweezers. Now brush them out and leave to dry. AiryHair is always working hard to offer you different choices, the same goes for our shipping methods. • Free international shipping: most of our customers choose this method because our order will be delivered within 10 to 30 days with no charge. We send them worldwide by registered air mail. • Rush shipping: If you need your eyelashes right away and can't find any places near you, go with the rush shipping. We deliver worldwide in only 1 to 6 business days. After your payment is confirmed, we will send your item right away, usually within one to two business days.